Adron Srif felt the air move by his neck as he ducked – nearly too late – and heard the clang of the metal spear strike the wall behind him. He'd been running for hours. Sweat dripped from his skin, pasting his coveralls to his clumsy frame. He forced himself to move faster, ignoring the burning pain as every muscle in his body resisted. Frazov was close behind now. The next spear might not miss. Adron ducked behind a stack of crates. He had to get out of the aisles. The path was too clear, too well lit. He hoped his pursuer would follow him into the light. He hadn't counted on Frazov fashioning ranged weapons. Stupid. Firearms and other advanced technology were forbidden. This had always been interpreted as melee weapons only. Nobody had turned the rite into a ranged fight before. Frazov wouldn't break the laws, but he would bend them as far as he could. Now Adron could only go further into the labyrinth and hope he could double back. He ducked down another aisle to his right. Now to the left. Left again. He had to keep moving. Frazov's military experience gave him the advantage. The tribe never talked openly about their pasts, but they all saw the uniforms each man and woman wore as they were brought in. They all saw Frazov's tattoos, marking his past campaigns and kills. He did not talk openly about his past, but he went out of his way to display his marks. It intimidated the others. It kept him at the top. Adron found a gap between two refrigerated containers. In the darkness he barely made out "frozen food" in block letters. He allowed himself only an instant to look over his shoulder for his pursuer. When no spear leapt from the darkness, Adron worked his way between the containers. His breath became shallow as the sides pushed in his gut. If he made it to the other side in time he might lose Frazov, at least for a few minutes. He was close to clear, only a few inches away, when he heard movement behind him. It was a quiet sound, like the pattering of a hound on asphalt. Adron held as still as he could. He waited. Time slowed. The still air pressed upon him. The sides of the container began to condensate by his warm body. The pain in his legs became a dull itch. The smell of his own sweat sickened him. He desperately wanted to block everything out but that sound. Minutes passed. The sound did not come again. Adron tried to turn his head to see behind him, but there was not enough room. It had been long enough; surely if Frazov knew where he was, he would have struck already. The ex-soldier was a sadist, but also efficient. Carefully Adron slid his hand towards the edge to pull himself through. Then the silhouette of Frazov appeared in front of him. That Adron did not scream was a tiny miracle. He froze stock-still. In his childhood he had stayed up late watching holos of great planetside monsters that were attracted by movement. The only defense was to remain perfectly still and allow the monster's gaze to pass by. He had no reason to trust the old stories, but in that moment he could think of nothing else. There was no mistaking the muscular frame of Frazov, even in the shadows. The soldier kept his center of mass low, ready to pounce. He held another sharpened pole in his hands. He kept two pieces of steel rebar in his belt for quick access. Thinning grey hair was closely shorn. Tattoos were mapped across his chest and back. Servos whispered as he moved his prosthetic arms, victims of some past campaign. The gold finish so popular among the Amarr had long ago worn off, leaving only a dull grey metal. Absolute stillness. Adron concentrated on it with everything he had. His pursuer tilted his head, as if the hum of the refrigeration units were telling him Adron's secrets. Adron's lungs burned, demanding more air. It was too much. He couldn't hold on much longer. Then the Amarr swung the spear on the side of one of the containers. "You have to be tired, Second. It has been a long chase. Forfeit now and it can all be over. I will even allow you some of your old freedoms. You can remain Keeper of Records. You can even write my memoirs. Do you hear me, Second?" He banged the spear on the container again. Relief flushed through Adron as he realized the strikes were down to nothing more than Frazov's own need for self-aggrandizing dramatics; the Amarr had no idea where he was hiding. "How about marriage? I know you've been eyeing Kathel. Submit to me, accept defeat, and I will bless your union. All you need do is stop running." Frazov paused again, then grunted when no answer came. "My patience is wearing thin, Second. I might not be so magnanimous if I have to hunt you down." He pulled the spear close to his body and took off in a run. Adron waited several more minutes and, only when he was sure, squeezed himself out from his hiding place. He’d bought himself some time. He had to use it well if we as going to survive the rite, let alone win. If he was to survive, he'd need tools. Adron wished he knew something, anything, about engineering traps. He knew how to keep things clean and orderly. That's how he’d risen to be Frazov's Second in the first place. The tribe would have descended into chaos long ago without his help. But Adron had gotten too full of himself and challenged Frazov's direction. He’d thought he would outsmart the old man in minutes, quickly rising to First. He hadn't counted on the Amarr's speed. Maybe if he had something that moved faster than Frazov? He could find a crate of firearms, and then destroy the body so nobody saw the wound. No. It wasn't just a law for honor's sake. Gunfire would set off security alarms, bringing the authorities down on the whole tribe. There had to be another solution. Adron inhaled deeply, closed his eyes, and calmed himself as the tribe had taught him. He remembered the day he was plucked from the stars. The explosions. The wind that ripped him from his hall and tore the broom from his hand. The cold. He remembered the god's chariot, the light and warmth within his craft. The miracle of his new life. He remembered the Pilot. Then he had his answer. It took an hour to prepare. The labyrinth was a monument to the Pilot's exploits. It was easy to become lost among the hundreds of aisles of equipment and containers. 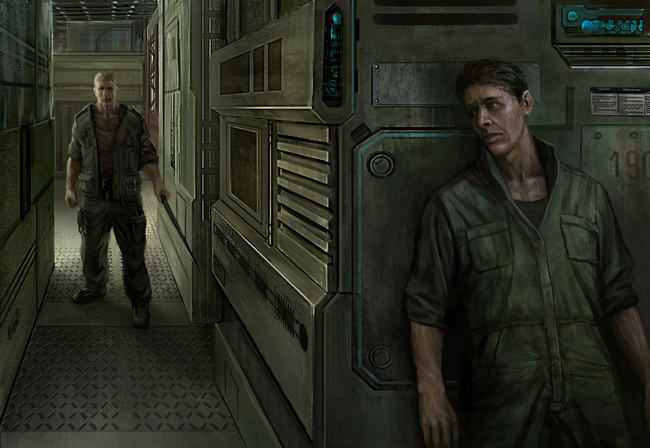 A strong head for order was needed to navigate the maze without the aid of a datapad. Luckily it was a trait Frazov lacked. Adron only got lost twice while gathering the right materials. The crates and equipment were arrayed in a large circle. Floodlights illuminated the center of the circle. As a final touch Adron painted himself in dramatic war patterns, using engine grease and painter's chalk. He allowed himself a momentary smile at his own cleverness. There was little else to do, now. He hefted the makeshift spear he had recovered from Frazov's failed attempt. Adron walked to the center of the ring, practiced his breathing technique one last time, and slammed the spear upon a crate. "Frazov! You get yourself lost? Here I am! Why don't you face me directly? Stop this great Amarr hunter crap." Adron's heart raced. The lights made him the most visible thing in the bay, but they also prevented him from seeing anything outside. For all he knew Frazov was standing outside the ring now, staring at him. Worse, he thought, Frazov might not even get that close; the second spear might merely leap from the darkness to impale him directly. He obsessed over that image until his vision blurred from the stress. He struggled against nerves to yell again. "Frazov! W-what's the matter? Afraid of a proper fair fight?" "Really, Second?" Frazov's voice came. "You're trying to lure me in with the fair fight line? If it were a fair fight, you would be dead in seconds. But you know that. You would only call me out if you had a trap prepared. So tell me, Second, why shouldn't I just take you down now?" "Because..." Adron trailed off. He was forgetting his lines! He shut his eyes to concentrate. "There's a holo-recorder to my right. A bit of a violation, but it's not really a weapon. Besides, you've got the arms. So, anyway, it's recording now. If you face me, one on one, you'll have video evidence of your victory. You could show it over and over again to celebrate your greatness and my defeat." The voice snorted. "My vanity, now? You always were clever, Second. I'll tell you what: I will play along with this. You know I never could resist a show." A loud clang from behind startled Adron, metal striking metal. He spun around to find Frazov already in the ring, holding his own spear. "Anything else before I undo your trap and humiliate you, Second?" "Yeah. We throw away both our spears. We fight as we were when the Pilot delivered us." Frazov raised a single eyebrow. "Bare-handed, then?" He flexed a metal hand. "A severe handicap for you." "Interesting. Your show, Second." With a smile Frazov threw his spear into the darkness outside the ring. For a moment Adron contemplated using his spear on his opponent then, but thought better of it. Frazov was still too fast. Adron threw his spear away as well. No sooner had Adron thrown the spear than Frazov charged. Adron took a metal shoulder to the gut. He rolled on the ground, gasping for breath. "Is this what you want, Second? Where are your tripwires, your spring-loaded javelins? Or maybe you just thought I'd feel bad for beating you senseless on holo?" Frazov sauntered to the other side of the ring, already confident in his victory. Adron tried to pull himself up on one of the ring's containers but tipped it instead. A milky liquid spilled out, covering the floor of the ring. Frazov backed away at first, then poked at the puddle with his foot. He laughed. "Grease? That's your big trap? You think you'll slow me with some damn grease? And really, Second, you could have at least picked a more slippery type. Look, I can walk right on it!" Frazov marched through the puddle and over to Adron and lifted him straight up by the neck. Adron kicked and struggled as best he could, keeping one hand free to search for his find from the cooking supplies. "I didn't want to have to do this. If you had remembered your place, you could have lived the rest of your life as my Second. But now I have to defeat you. You will be exiled from the tribe. You will be sent back to whatever hellhole you called a home before the Pilot delivered you, and you will die alone, all because--"
Frazov's sentence ended in a scream as Adron threw a fistful of salt directly into his eyes. The Amarr grasped at his face, letting Adron fall to the floor. Adron scrambled up and to the other side. He grabbed a small chemical tub from another container. Frazov drew one of the pieces of rebar he hid and threw it at Adron, but his vision was so blurred that Adron easily deflected the rebar with the tub. The Amarr followed up with a blind charge, but Adron was ready, dumping the liquid contents of the tub at his feet while diving to the side. Frazov slid to a stop. The older man took a moment to clear his eyes, now red and angry, and fixed squarely on his opponent. He went to take a step, but found his feet wouldn't move. "It's a chemical adhesive. The two chemicals are innocuous themselves. Put them together, though, and they react to form a mighty solid glue. And before you raise a fuss, Caldari ship builders were using this stuff centuries ago to put their wooden sailing ships together, so it's not advanced technology. Not technically, anyway." Adron smiled at himself again. He produced a small bottle of a third liquid that he sprayed at his feet. "This is a liquid solvent. It dissolves the chemical bond. I'll be glad to let you use it if you concede victory to me. If not, well, I've used that stuff to repair seal leaks. The stuff lasts." Rage and confusion filled Frazov's face. "This wasn't combat! You can't win like this!" "Pretty sure I can. The laws say I have to beat you. I beat you. If you hadn't tried to kill me with a spear earlier I might have let you stay as my Second. As it is, I think I'll have to exile you. You understand." Adron turned his back to the Amarr. The glue would hold. He'd let him stew for a few minutes, then he'd come back to negotiate. Frazov was useful. The tribe would be stronger for his presence. Adron paid no attention to the whirring sounds, or the quiet click of tiny mechanical parts moving into place. All he took notice of was the bang, but by then it was too late. Kathel took the third clipboard from the security officer and began filling out the forms. Each form required seven signatures, none of which Kathel was legally able to sign. The tribe had worked out an agreement with station security long ago to avoid most such legal complexities. Filling out the forms in paper was longer, but avoided digital identity safeguards. Bureaucracy has its own complex ceremonies. "You sure this is how you want it to go down?" the officer said. "Drug fight, I mean?" Kathel didn't look up from her clipboard. "Is that unreasonable? Pilots often store numerous drugs." "No. I mean, yeah, it's reasonable. Just, these are your friends, right?" "Family is a better term." "Family. Well, after the weapons fire, we arrived on the scene to find your Amarr uncle glued to the floor, your Deteis cousin dead on the ground with a hole in his head, and a holoreel of the two beating the crap out of each other until the uncle takes out your cousin with a snub-nosed baller, concealed in a prosthetic limb. Now, we both agree it's in nobody's interest to put all that in the report, but don't you want something more dignified than a drug bust for the two of them?" "The one that deserved dignity has returned to biomass. The other broke the laws, and therefore deserves no dignity." Kathel replaced her pen within her dockworker jumpsuit and handed the completed forms back to the security officer. "There you go. I believe everything should be in order." The officer took the clipboard and checked the papers over. "Alright. The Deteis was one Adron Srif. Pronounced legally dead after a capsuleer raid on a station two years ago. Suspect is Frazov, Corporal in the Amarr Navy, listed as KIA a year ago during a raid by capsuleer pirates. The Empire's going to have a fun time working back into the system just to try him, I bet." "Returning to life is never easy, for first you must die." "Right. You know, I can make some calls, get your identities back. Bet you the capsuleer doesn't even know you're here. You don't have to live in this weird legal purgatory just because CONCORD and the empires can't get their acts straight." "Officer, have you ever truly belonged somewhere? Where you always feel safe and at peace because you trust the one above you implicitly?" The officer nervously scratched his head. "Uh." "That is what we have here. I appreciate your kindness, but we are perfectly fine." She walked the officer to the exit from the cargo bay back to the main station. He was nearly out the door when he turned back to face her. He held out an ID chip. "Let me know if you have any other concerns. Here's my comm ID if you think of anything. Ask for Bellot. Anything I can do for you, miss...?" She took the chip and placed it in her pocket. "First. You may call me First." The officer raised his eyebrows and began to ask, but thought better of it and turned away. Kathel sighed to herself. The rite had ended badly, and now she had to pick up the pieces. The man Bellot seemed nice enough. She entertained the idea of bringing him into the tribe, but she quickly dismissed it. She could not make someone tribe. They had to be delivered. She would have a partner, eventually. The Pilot always provided.